A Federal High Court, Lagos, on Tuesday fixed February 6 to hear a suit filed by Oba Otudeko against Alhaji Aliko Dangote and the Nigerian Ports Authority over a land dispute. Justice Okon Abang adjourned the case at the instance of the counsel to Dangote, Mrs Fola Sowemimo, to enable her to file written statement on oath. The News Agency of Nigeria reports that Otudeko, Chairman of Honeywell Group, had filed the suit in 2006 at Justice Ramat Mohammed’s court. He is claiming $48m against the defendants as damages for breach of contract over a 10.8 square metres of land within the Lagos Ports Complex, known as the 5th Apapa Wharf Extension. In the suit, the NPA, Bureau of Public Enterprises, Dangote Industries Ltd, Dangote and Greenview Development Nig. Ltd, are listed as first, second, third, fourth and fifth defendants respectively. NAN reports that the suit was subsequently transferred to Justice Abang after the retirement of Mohammed. When the case came up on Tuesday, counsel to the plaintiff, Dr. Joseph Nwobike (SAN), told the court that the case was slated for trial. According to Nwobike, he is faced with the challenge of retrieving the exhibits tendered before the former judge. The counsel, therefore, asked for an adjournment to enable him to retrieve the exhibits. Meanwhile, counsel for the third, fourth and fifth defendants, Sowemimo, has argued that the case was not yet ripe for hearing since the defence had yet to file its written statement on oath. Abang had in a bench ruling adjourned the case to February 6 and ordered the defence to file its written statement before the next date of adjournment. In his statement of claim, Otudeko averred that by an agreement, NPA leased the land to him for five years for N2.2m yearly. He said the land was to be used for the setting up a bulk food handling facility, adding that in keeping with the agreement, it paid the amount and additional N290,000 for survey. 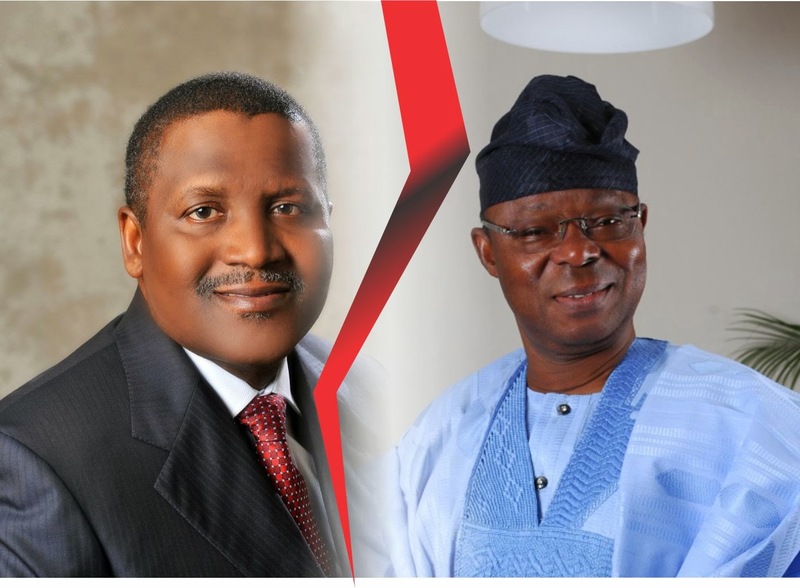 According to the plaintiff, the BPE suddenly suspended his pre-existing rights, and granted the concession to Greenview Development Ltd belonging to Dangote. He said that NPA and BPE later asked him to vacate the facility to ensure its smooth transfer to the new operator. Otudeko averred that Dangote, through his agents, harassed, threatened and ordered his employees to vacate the land. Otudeko urged the court to declare Honeywell Group as the exclusive legal occupier of the land and to restrain the defendants from treating it as a stranger or trespasser on the land. He also wants the sum of $48m as damages for additional expenses. This entry was posted in News and tagged latest Nigerian news, Nigeria, Nigerian Politics, Otudeko vs Dangote.